Riddled with historical inaccuracies. James J. Braddock NEVER hit the concierge with a phone! I don't like Russell Crowe. I'm not trying to be contrary or a rebel by making this claim. I know he's an Oscar winner and perennial nominee. "Gladiator" made a ton of coin and is beloved by all. "A Beautiful Mind" moved even the most hardened criminals to tears. Everyone loves Russell Crowe. I watched these movies and had almost no reaction. I didn't find them exciting or emotional. And I felt that most of my non-reaction to this was due to Mr. Crowe. Being a consumer and fan of the BIG BUDGET SUMMER BLOCKBUSTERS, as 'mindless' as the guy next to me wearing the Darth Vader helmet in the movie line, the fault had to lay with Russell. And as superficial as the encounters were, when I'd see Crowe on the interview circuit shilling for his latest release, I always got that smarmy feeling from him. How's that for shallow? I'm basing my feelings about the man based on what he has to say to Jay Leno. But there it is. The only dislike for Crowe that I feel has any merit is my loathing of his music career. I don't automatically dismiss all actors' musical musings, but when they're unapologetically SERIOUS about it, it drops my opinion of them a few notches. And Russell's band, '30 Odd Foot of Grunts' (?!) is all about the music, man. Blech. But I digress... 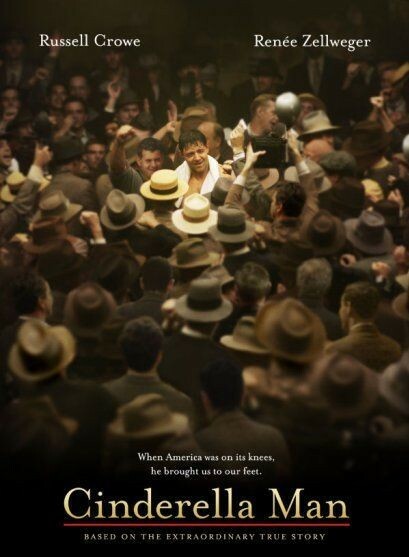 When I saw that Mr. Crowe was going to be starring in a Ron Howard-directed movie about heavyweight great James J. Braddock, I had the very definition of mixed emotions. My dislike of Russell Crowe was tempered by my obvious love of boxing movies, as well as a deep respect for Mr. Ron Howard's ability to create some fantastic examples of the aforementioned BIG BUDGET SUMMER BLOCKBUSTERS, "Apollo 13" and "Backdraft" (and, to a lesser degree, "Gung Ho") being favorites. I know it's been said before, and I'm sure it'll be joked about again, but, Opie can DO some directing... AM I RIGHT OR AM I RIGHT?! HIGH FIVER BRO! Anyway, that's what my mindset was before going to see "Cinderella Man" back during its original release; hate Smarmy Crowe, love Ron Howard and Boxing. . how's it gonna turn out? James J. Braddock (Crowe) was right at the edge of superstardom in 1929. A top light-heavyweight contender, living in a ritzy neighborhood of North Jersey, a beautiful young wife by his side; all was well. But like so many others, Braddock was hit hard by the Depression the following year, and that, coupled with some losses in his boxing career, has the "Bulldog of Bergen" reduced to low-paying dock work in order to keep his wife (Zellweger) and kids warm and fed. Braddock's manager, Joe Gould (Giamatti), is trying his hardest to get his man some fights, but everyone, including the New York State Athletic Commissioner (played by Bruce McGill, showing off his Irish brogue) thinks that Braddock is a has been by 1933, and Braddock's record in the ring does little to dispute this claim. But when things seem their most dire, Gould manages to find a decent paying fight for Braddock. A tune-up for one of the up-and-coming guys in the heavyweight ranks, Corn Griffin (up-and-coming Canadian heavyweight Art Binkowski, playing against type). Braddock is given no shot of winning, and James seems resigned to the idea of this just being a payday, nothing more. But something magical happens in the ring that night, and Braddock knocks Griffin out. Braddock is as surprised as anyone, more excited by the thrill of the moment than by any thought of resurrecting his boxing career. Braddock's wife Mae is very apprehensive about her husband earning a living as a fighter, but it's soon apparent that a comeback is the only way he's going to save his family. The long layoff has afforded James a chance to get healthy again, and he continues to win, gaining a following amongst the blue-collar crowd (which, during the Depression, was just about everyone). He gains popularity with each victory, and before long he's matched up with the world heavyweight champion, Max Baer (played by Craig Bierko), a fearsome puncher who's portrayed in this rags-to-riches story as the perfect villain (more on that later). The performances in "Cinderella Man" were something to savor. Paul Giamatti is an endlessly talented actor, with an equal flair for comedy and drama (see "Sideways" as an example). And proving my prejudices wrong, Crowe plays a boxer AND a loving family man (from North Bergen no less!) with aplomb. His Jersey accent wavered occasionally, but his work in and out of the ring was Oscar-worthy. Renée Zellweger took what could have been a thankless and bland part as Braddock's wife and made it emotional and poignant. The only role that I have any qualms with is Craig Bierko as Max Baer, and it has nothing to do with Bierko's performance. He plays the bad guy perfectly in this film, and he plays a convincing heavyweight champ. My problem is the presentation of Baer as a violent and reviled man, both in and out of the ring. The idea that Baer would relish killing a man during a fight is unfair to the man. And the idea that the public was completely in Braddock's corner during their epic match-up is also false. Baer (who died in 1959 at the age of 50 from a heart attack) is remembered as one of the sports most colorful and celebrated figures. His popularity and charisma eventually translated into a movie career. While I know the film isn't meant to be a historical document, misrepresenting Baer, even for dramatic purposes, is just unfair. That misgiving aside, I was very impressed with this film. The marriage of drama and sports action was presented perfectly, bringing to mind some of the other great boxing movies of the past. Ron Howard took a staple of the SUMMER BLOCKBUSTER, special effects, and put them to practical and seamless use during the fight scenes. Like all great sports movie, he transcended the clichés and had me cheering in the theater. Perfection, to put it simply. Seeing this in the theater was a special experience, and I hope they re-release this during Oscar-season. Watching the fight scenes with a crowd is fantastic. How often have you heard a crowd collectively gasp after a brutal body punch? I've certainly never heard it during a MOVIE! Every punch is felt, with a flash of black and white on the screen, the crunching of bones, and the slo-mo anguish of the fighters. The subtle but effective flash of x-rayed bones on impact had me cringing. The settings were rendered to perfection, and the performances of Crowe and Bierko in the ring were as real and exciting as any heavyweight fight I've seen recently (which, upon reflection, isn't nearly the compliment that I mean to pay). "Cinderella Man" deserves to be mentioned in the same breath as "Raging Bull" when it comes to the fight action. It's the best I've ever seen. It's unfortunate for the filmmakers that I didn't review this film right after I saw it. I'm able to dismiss the highly publicized confrontation Russell Crowe had with a hotel worker during the promotion of this film (which only feeds my preconceived notions of him as a person). But after researching the historical fights presented here, I'm less forgiving of the treatment of Max Baer. While the movie is only "based" on a true story, it's usually the hero's accomplishments that are embellished. Disparaging another man for theatrical gain is dirty pool in my book. It's the one sticking point that I think keeps "Cinderella Man" from being the greatest boxing movie of all time. If you can put that aside and just enjoy it for enjoyment's sake, it's on par with "Hoosiers" and "The Natural". If those 2 put a lump in your throat and had you cheering for more (like they did for me), then you're going to love this movie.